Sree Gogineni, MD, is an internist who practices in the Washington DC/Metro area. Her clinic, Capital Area Internal Medicine offers two locations: Vienna and Ashburn. With a goal of mentoring patients in dealing with day-to-day health issues, Dr. Gogineni blends modern technology and traditional medicine to practice preventive health care. She focuses on both mind and body as a way to help people become fit and happy. Dr. Gogineni believes strongly that by listening to her patients, she will hear and understand their concerns while helping them to achieve better health. 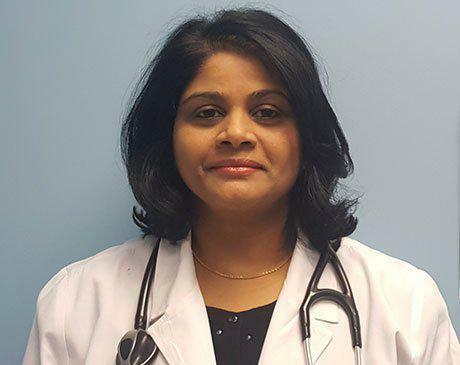 A graduate of the prestigious Guntur Medical College in India, from which she graduated in 1994, Dr. Gogineni completed her internal medicine internship and residency at the University of Illinois in Urbana-Champaign. Patients appreciate her warmth, dedication and high quality of care, as well as familiarity with other languages and customs (she speaks English, Hindi, and Telugu). She is board-certified in internal medicine and currently affiliated with Inova Fair Oaks Hospital and Inova Fairfax Hospital in Northern Virginia.